The Somerset County Federation of Women's Institutes recently had a decorated t-shirt competition. Each individual WI first of all held their own competition and the winners went forward to the county competition. I was lucky enough to win in our own competition and my t-shirt then came second in the county competition. Really, the one thing I though when I was deciding how to decorate my t-shirt, was that I wanted it to be wearable. I had some scraps of very expensive fabric, where flowers were appliquéd and embroidered on to corduroy. 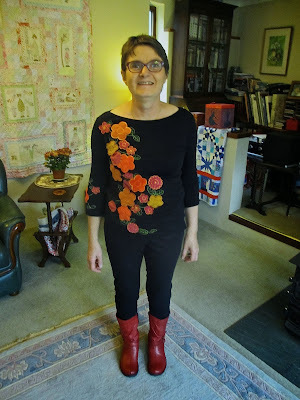 I first of all embroidered some vines on the t-shirt - I used Stitch and Tear to stabilise it - and then applied the cut out flowers. I was pleased with the result and wore it today when we had some friends for lunch. Christopher had to take about ten photographs before he got one that was half way reasonable - of me that is, the t-shirt looked fine every time! I'm now planning to make another one for Christmas.